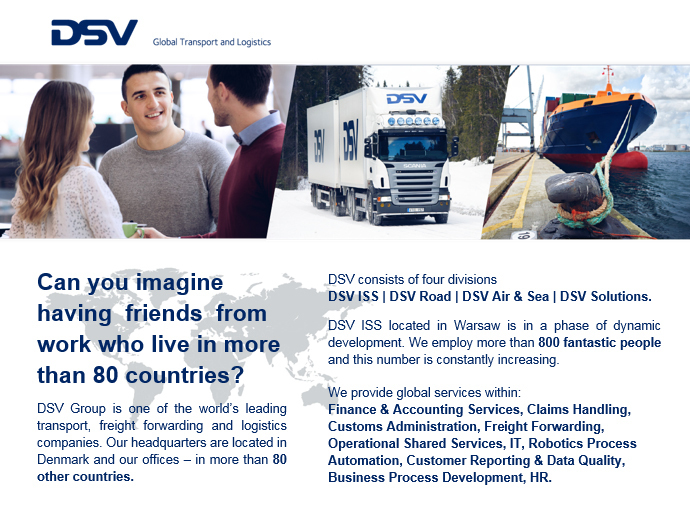 At DSV ISS we offer local and global IT positions in a rewarding and challenging environment. DSV Global IT is accountable for the strategy, system architecture, development and day-to-day operation & support for our global infrastructure and business applications. At every IT position at DSV ISS you have a real influence and a chance to produce visible results. Employment contract without trial period. Benefit package among others private medical care, sports card, insurance, occasional gifts. Free Business English lessons and real opportunities to use this language on a daily basis. Development in the chosen direction thanks to the career pathways, training sessions, cross-functional projects, promotions and inter-departmental promotions. Comprehensive implementation programs specially tailored to the department and position. Friendly working atmosphere and work-life-balance. Unique organizational culture (charity actions, contests, meetings and integration events, sports sections). Modern office in Mokotów area (approx. 15 minutes from Wilanowska metro station) with ergonomic workstations, fruit days and a wide range of beverages. Providing 1st and 2nd level IT Support Services in 24/7 shift rotation. Accepting users’ requests (mail, phone, WWW), its classification in global ticketing system, initial troubleshooting and 1st line resolution, escalation to 2nd and/or 3rd level support teams in line with SLA targets. Informing and supporting end users in the event of IT system unavailability. Communicating planned outages and service windows to end user community. Account administration and password management of many IT systems in use. Development and maintenance of support documentation (Knowledge Base). Ensuring high level of customer support and their satisfaction. would like to work in a friendly atmosphere and create it with us. “I give my consent for the processing of my personal data by DSV International Shared Services sp. z o.o. with its registered office in Ożarów Mazowiecki 05-850, at Ożarowska 40/42 Str., Duchnice, for the purpose of current and future recruitment processes and verification of my professional skills, as well as for the transfer of my personal data to other companies belonging to the DSV ISS group for the purpose of any recruitment processes in the future”. Please be informed that the data controller of personal data included in the recruitment documents sent by you is DSV International Shared Services sp. z o.o. with its registered office in Ożarów Mazowiecki 05-850, at Ożarowska 40/42 Str., Duchnice (hereinafter: “DSV ISS”). The aforesaid personal data will be processed for the purpose of the recruitment process relating to your application and verification of your professional skills. The personal data will be processed on the basis of article 22 (1) of the Labour Code and article 6 paragraph 1 item c) of European Parliament and UE Council Regulation 2016/679 dated 27.04.2016 on the protection of natural persons with regard to the processing of personal data and on the free movement of such data, and repealing Directive 95/46/WE (hereinafter: “Regulation”). Your personal data will be processed for the purpose of any future recruitment processes subject to obtaining consent. The personal data will be processed on the basis of the consent constituted by article 6 paragraph 1 item a) of the Regulation and article 23 paragraph 1 item 1) of the Act on Personal Data Protection dated 29.08.1997. The personal data may be transferred by DSV ISS to other companies belonging to the DSV capital group for the purpose of future recruitment processes provided that your consent is expressed. You have every right to access to the content of your personal data as well as the right to: correct or delete the data, limit data processing, transfer the data, object and revoke your consent at any time. The revocation does not impact on the data already processed in compliance with the law. Provision of personal data is voluntary which shall, however, be necessary to participate in a recruitment process. Your personal data will be stored for a period of 6 months from the termination of recruitment process. If your consent to process the data for purposes mentioned by point 10 is submitted then the data will be stored for a period of 12 months. You have the right to lodge a complaint to the supervisory body – Inspector-General for Personal Data Protection – or other authorities entitled to supervise the observance of regulations related to personal data. “I hereby give my consent for personal data included in my application to be transferred by DSV International Share Services sp. z o.o. with its registered office in Ożarów Mazowiecki 05-850, at Ożarowska 40/42 Str., Duchnice to other companies belonging to DSV capital group for the purposes of any future recruitment processes”.